You are here: Home / Bullet Journal / Check Out the New Fox Den Resource Library! 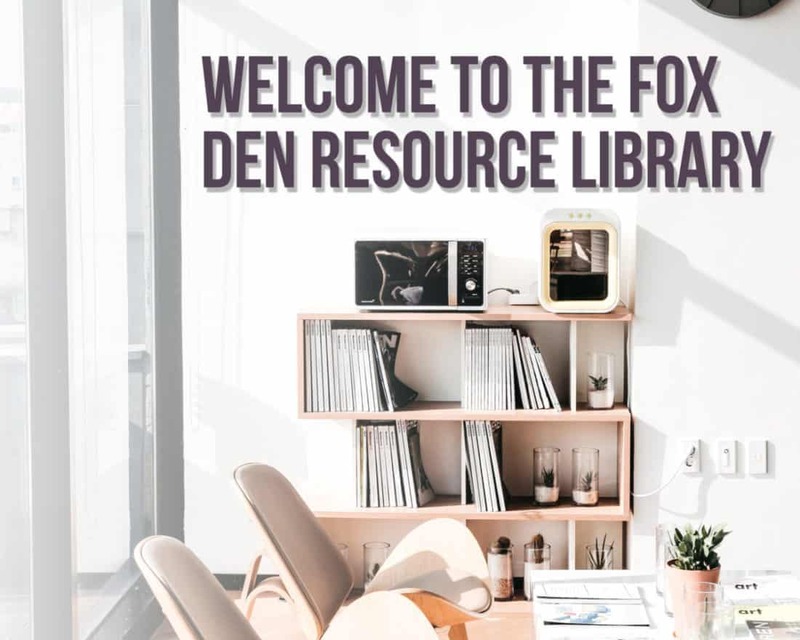 Check Out the New Fox Den Resource Library! Hello my friends! I have a little something for you. For the last several months, I’ve been working hard on a project mostly in secret. I wanted it to be a surprise when I was finally done, and at long last, the day has come and I am finished! So what have I been working on, you ask? Well, I have just completed the Fox Den Resource Library! I will continue to add more freebies and goodies to the library as time goes on, so that list will grow. I’m so excited to see what this library will become! It’s super simple. Just sign up below, and you’ll get the password sent to your inbox lickity-split! The password will change periodically, so make sure you stick around to keep receiving the latest one. Anyway, I just wanted to share this with you. Like I said, I’ve been working on it for months and I really put a lot of love into it. If you ever have any suggestions for things to add to the library, please don’t hesitate to shoot me an email! Thanks so much for being here with me. Now it’s time for me to get back to writing posts! I have signed up several times. When issued a password I am unable to access the library just like the girls above. There must be something wrong. I have inputted the password just as we are told. Also please make sure that the password has the first letter of each word capitalized, and that there is an exclamation mark at the end of the password. Please let us know if you continue to have troubles! Hello Charlcie! I just tried sending you an email regarding this issue and there seems to be a problem with your email address. Please email me at [email protected] so we can resolve this problem! It seems that I am having the same issue as many others that visit your site. I put in the current password and never get to the resource library, just to more options for old blog posts. From what I can tell, there isn’t much happening on your end as far as a solution. I like your ideas, enjoy the blog and your creative ideas. however one of the reasons I signed up for your email list was to get to the library. So I am wondering if this is an issue that will be repaired or not? When I enter the password, I am taken to the Library resource page, however the page section remains completely blank. I have refreshed several times to no avail ~~ can you assist, please? If so, can you tell me what you device you are attempting to access it on? Yes I am entering the password correctly at the https://littlecoffeefox.com/resource-library/ login page, with the same blank page each time. Many attempts have been made using tried bot mac & pc (safari, chrome & firefox). all results are the same. You will want to make sure that the password has the first letter of each word capitalized, and that there is an exclamation mark at the end of the password. Please let me know if you are still not able to access the library! My apologies for any inconvenience this may have caused. Numerous times I’ve submitted my email and name, got a welcome email from you with the password for the library, entered the password, and NOT gotten into the library. Instead, I keep being asked AGAIN for my name and email. Can you fix this, please. I’m sorry you are having trouble accessing the library. If you have your password already, you should be able to go to this link http://littlecoffeefox.com/resource-library/ and enter the password in the box directly below the text “Enter the password to explore the library! Not sure what the password is? Sign up below and then check your email!” Also please make sure that the password has the first letter of each word capitalized, and that there is an exclamation mark at the end of the password. Please let me know if you are still not able to access the library. My apologies for any inconvenience this may have caused.